I’m attending Aras Community Event 2011 these days in The Henrly Hotel in Dearborn, MI. You can have more information about new coming from the conference following my tweets on ArasACE. 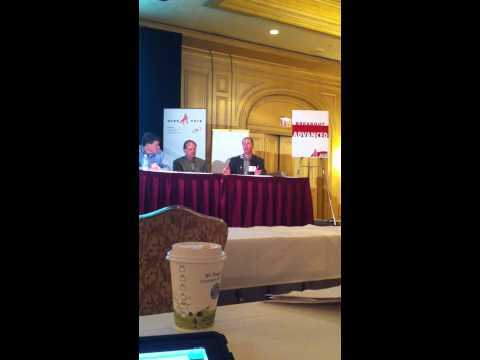 One of the sessions yesterday caught my attention – Enterprise Search Panel. Search is driving more interest in the ecosystem of Product Lifecycle Management and Manufacturing. I posted about enterprise search several times in the past. Navigate your browser to the following links to read my previous posts – PLM and Comprehensive Search, PLM Interest To Enterprise Search, Search Based Application and PLM Innovation, PLM Lifelike Search Injection. In the past, PLM companies had OEM agreements with enterprise search vendors (i.e. Endeca and Autonomy) to develop advanced search solutions. Last year Dassault Systems made a significant move in this space by acquiring enterprise search company Exalead. Two companies presented their enterprise search solution in this space – NorthRide and Alcove9. NorthRidge is primarily focused on development of search solution based on Open Source Solr/Lucene. Alcove9 is a spin off vDR Group. After development made on top of Autonomy and Exalead, Alcove9 is also moving towards Solr/Lucene platform. You may also check out Inforbix, developing product data application. Aras is following OSS strategy to solve their momentarily interest in search. Built on top of Microsoft technological stack, Aras made an experiment with Microsoft based Search solutions. Most of them are coming today from SharePoint space. I found the SharePoint search story a bit controversial. The actual cost of SharePoint solution can grow significantly depends on the size data storage and system configuration. Navigate your browser to the following interesting blog article to read more about The Real Cost SharePoint Search. You can also learn more about SharePoint search using ArnoldIT Overflight Search system. Navigate to the following link to browse through information about SharePoint search. Alcove9 and NorthRidge presented their solutions and vision of enterprise search related to Aras and PLM. Take a look on the following slides and make your conclusion. I found Aras’ strategy in the space of search interesting. I can expect customers are interested in search these days. PLM vendors experience challenging position in this place. We have seen OEM agreements and acquisitions made by other PLM vendors. Aras is taking an alternative way and playing with Lucene/Solr enterprise search platform to bundle it with Aras using community partnerships. Here is what Peter Schroer said about Aras Search Strategy.